It appears that the Mariners have released veteran backstop John Baker, according to Bob Dutton of the Tacoma News Tribune (via Twitter). Obviously, Seattle just added an additional catcher to its organization with the acquisition of Welington Castillo. Baker, 34, has hit just .161/.185/.194 in 65 plate appearances this year with Tacoma. He has seen big league action in seven seasons. The Rangers have assigned right-handed reliever Stolmy Pimentel to Triple-A after he cleared waivers, Evan Grant of the Dallas Morning News reports on Twitter. Texas will no doubt be pleased to retain the rights to the 25-year-old, who owns a 3.97 ERA over 11 1/3 innings on the year. Pimentel has seen his strikeout numbers plummet from double figures last year to just 5.6 per nine thus far in 2015. Blue Jays lefty Jeff Francis has cleared outright waivers and is expected to report to Triple-A, Ben Nicholson-Smith of Sportsnet.ca tweets. The 34-year-old has given up nine earned runs over 12 innings thus far, though he has struck out 15 opposing batters while walking five. The Rangers have purchased the contract of left-hander Sam Freeman from Triple-A Round Rock and designated right-handed reliever Stolmy Pimentel for assignment, executive VP of communications John Blake announced (on Twitter). The 25-year-old Pimentel has worked to a 3.97 ERA with a 7-to-3 K/BB ratio in his 11 1/3 innings with the Rangers since being claimed off waivers from the Pirates. Despite the lack of punchouts, Pimentel sports a swinging-strike rate of 10.9 percent this season and 12.9 percent in his career — both of which are considerably higher than the league average of about nine percent. He’s also racked up a 48.6 percent ground-ball rate and averaged 92 mph on his heater (though that mark is admittedly down from his 2014 average of 93.3 mph), making him a relatively intriguing bullpen piece for teams looking for middle relief help. In a small sample of work this season, Pimentel has showed a pronounced platoon split, yielding a .443 OPS to righties but a 1.071 OPS to lefties (again — in just 14 plate appearances). His splits have been less notable throughout his brief, 53 1/2 inning Major League career, however. I’d imagine that Pimentel will generate some interest from other clubs in the 10-day window that Texas has to trade him or attempt to outright him to Triple-A. The Rangers have announced that they’ve claimed righty Stolmy Pimentel from the Pirates. To clear space on their 40-man roster, the Rangers have transferred Lisalverto Bonilla to the 60-day disabled list. The Bucs designated Pimentel for assignment last week. The 25-year-old Pimentel is out of options, so he’ll join the injury-ravaged Rangers’ 25-man roster, with a forthcoming move yet to be announced. He has strikeout stuff, with a good fastball and 10.5 K/9 in the Pirates’ bullpen last season, but he also walked 16 batters in 32 2/3 innings and posted a 5.23 ERA. He was mostly a starter throughout his minor-league career (which included several stops with the Red Sox before he headed to Pittsburgh in the Joel Hanrahan deal), but it might be hard for him to develop as a starter without being able to head back to the minors first. The Pirates have announced they have designated right-hander Stolmy Pimentel and infielder Pedro Florimon for assignment. The Pirates were forced into these moves since both Pimentel and Florimon are out of options. The Pirates now have 10 days to either trade, release, or outright the pair to the minors. It was on this day in 1974 that the first real "free agent" signing in modern baseball history was made by (who else?) the Yankees when they inked Catfish Hunter to a five-year, $3.75MM deal. Hunter was freed from his previous contract with the A's after an arbitrator ruled that the club has breached the terms of the right-hander's deal, thus paving the way for Hunter to sign with New York. The deal was a record for its time, as Hunter was earning three times as much money as any other Major League player. The Yankees have learned several lessons in 2012 including Alex Rodriguez is less dependable than ever and their fiscal cliff is real, according to LoHud.com's Chad Jennings. Right-hander Stolmy Pimentel was part of the trade package the Red Sox sent to the Pirates in the Joel Hanrahan deal. WEEI.com's Alex Speier looks at Pimentel's career arc and wonders if his departure could signal a change in how the Sox value their prospects in terms of their trade value. Sergio Santos spent almost all of the 2012 season on the DL but his ability to provide depth at closer will be a major factor in the Blue Jays' playoff drive in 2013, writes Richard Griffin of The Toronto Star. Santos was expected to be the Jays' closer last year but Casey Janssen stepped into the job and performed well, making him the incumbent late-game choice heading into next season. Griffin thinks Santos will be the choice to take over the job if he stays healthy, though I don't see the Jays making a switch unless Janssen struggles. Just a reminder that you can keep track of all the closer news on MLBTR's sister Twitter feed @CloserNews. If the Nationals re-sign first baseman Adam LaRoche but miss out on free agent southpaw J.P. Howell, MASNsports.com's Dan Kolko suggests that the Nats and Orioles could match up on a trade. In Kolko's proposed deal, the O's would send one of their several left-handed relief options to Washington as part of a package in exchange for Michael Morse, who would be expendable for the Nats if LaRoche was back in the fold. In other AL East news from earlier today, we learned the Rays are in the market for more relief pitching. On the heels of back-to-back All-Star appearances, the Pirates have traded away their closer one year before he hits free agency. Pittsburgh has dealt Joel Hanrahan and infielder Brock Holt to the Red Sox in exchange for reliever Mark Melancon, first baseman/outfielder Jerry Sands, infielder Ivan De Jesus Jr., and right-hander Stolmy Pimentel. Both teams have announced the trade. 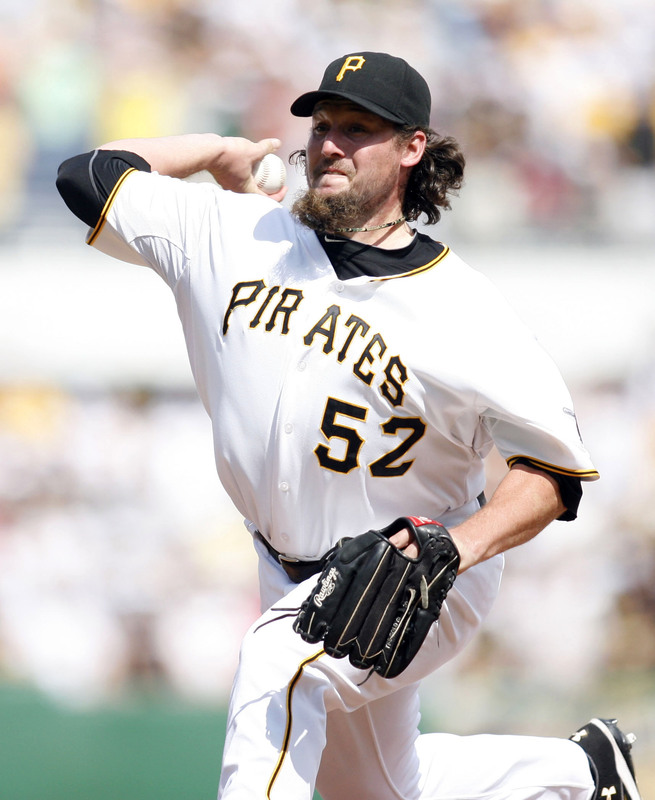 Hanrahan, 31, pitched to a 2.72 ERA with 10.1 K/9 and 5.4 BB/9 in 59 2/3 innings for Pittsburgh last season. Despite having a reputation as a strong closer, some rival evaluators have been concerned about his conditioning and recent proclivity for walks. Hanrahan's walk rate climbed from 2.1 BB/9 in 2011 to 5.4 BB/9 in 2012. Matt Swartz projects the right-hander to earn $6.9MM through arbitration this winter after pulling down $4.1MM in 2012. Brian MacPherson of The Providence Journal notes he will not net the Red Sox a compensation draft pick if he signs elsewhere based on the assumption Hanrahan will accept a pricey qualifying offer (Twitter links). Melancon, 27, pitched to a 6.20 ERA with 8.2 K/9 and 2.4 BB/9 in 45 relief innings with the Red Sox after being acquired from the Astros last winter. He spent some time in Triple-A as well, then returned to the big league club at midseason. Melancon struck out 40 and walked just ten in his final 43 innings of the season. The former Houston closer will step into Pittsburgh's bullpen to provide depth behind the recently re-signing Jason Grilli, who will take over as closer. Both Sands and De Jesus came to the Red Sox in their summer blockbuster trade with the Dodgers. The 25-year-old Sands owns a Triple-A batting line of .288/.362/.552 with 55 home runs in 940 plate appearances across the past two years. He also has 70 big league games to his credit, most of which came in 2011. De Jesus, 25, has 80 big league plate appearances under his belt and is a .303/.355/.416 hitter in 1,294 career Triple-A plate appearances. The Red Sox had recently removed him from their 40-man roster. Pimentel, 22, was rated as the sixth best prospect in the Red Sox's organization in 2010 by Baseball America but was bumped down to No. 23 the following year. The 6-foot-3 right-hander boasts a strong changeup but has failed to impress at the Double-A level. In 37 starts for Double-A Portland, the youngster has posted a 5.96 ERA with 6.3 K/9 and 3.5 BB/9. Alex Speier of WEEI.com notes that Pimentel was targeted by the Pirates in 2008 as part of the three-way deal with the Dodgers and Red Sox that resulted in Manny Ramirez going to LA and Jason Bay coming to Boston, but the Sox refused to include him. Holt, 24, was rated as the 27th best prospect in the Pirates' farm system in 2010 by Baseball America, but he has not been featured by the publication in their annual Prospect Handbook since. He hit .292/.329/.354 in 72 big league plate appearances this season, his MLB debut. Holt has hit .317/.381/.427 throughout his minor league career, including a .344/.406/.453 showing between Double-A and Triple-A this past season. He's played the middle infield exclusively as a professional, spending most of his time at short rather than second. Andrew Bailey, Boston's incumbent closer, pitched to a 7.04 ERA in 15 1/3 innings in 2012 while missing most of the year with injuries. The additions of Hanrahan and Koji Uehara give the Red Sox some late-inning bullpen depth along with Junichi Tazawa and possibly Daniel Bard if he can bounceback from a disastrous season. The Pirates will pair Melancon and Grilli with Jared Hughes and Tony Watson, though they could also seek additional relief help on the free agent market. ESPNBoston.com's Gordon Edes first reported that the two sides were nearing an agreement while ESPN's Jim Bowden reported the agreement (on Twitter). Jon Heyman of CBSSports.com, John Tomase of the Boston Herald, MLB.com's Evan Drellich, MLB.com's Peter Gammons, and Ken Rosenthal of FOX Sports all added details on Twitter. Mike Axisa contributed to this post. Photo courtesy of USA Today Sports Images.